Our Best Multimeter. Now with Zoom Capabilities! As promised, we continue to add capabilities to the 289 multimeter. Version 1.1 upgrade includes a variety of new features including a zooming ability to view and analyze TrendCapture data at five (5) times magnification. 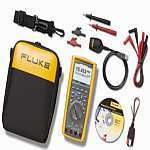 The Fluke 287 True-rms Electronics Logging Multimeter with TrendCapture quickly documents design performance and graphically displays what happened. Its unique logging and graphing capabilities mean you no longer need to download logged readings to a PC to detect a trend. The Fluke 287 packs more accuracy and convenience into a handheld multimeter than ever before, putting more problem solving power in your hands. It is the ultimate handheld tool for demanding applications that require high-precision. Be sure to also check out the Fluke 289 True-rms Industrial Logging Multimeter with TrendCapture designed for industrial professionals. New with V 1.1 Upgrade! Logging function with expanded memory for unattended monitoring of signals over time. Using on-board TrendCapture users can graphically review logged readings without needing a PC. Store up to 15,000 recorded events. Large 50,000 count, 1/4 VGA display with white backlight. Multiple sets of measurement information can simultaneously be displayed at the same time. Logging function with TrendCapture is an essential tool for documenting the performance of your designs, processes or systems, or unattended monitoring while you work on other projects. It plots measurements as a single line to help detect signal anomalies over time. Using on-board TrendCapture, you can graphically view logged readings without a PC. (Software and interface cable optional). i-info button. On board help screens for measurement functions. Unsure about a function Go to that function and Press the i button.